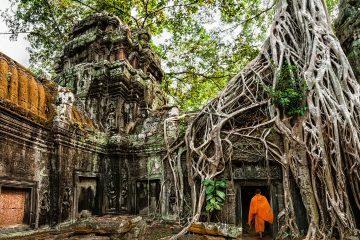 Anyone who has heard of Cambodia probably thinks of temples and Tomb Raider. But after you have seen all of the temples, what is there left to do (besides drink $0.50 beers)? 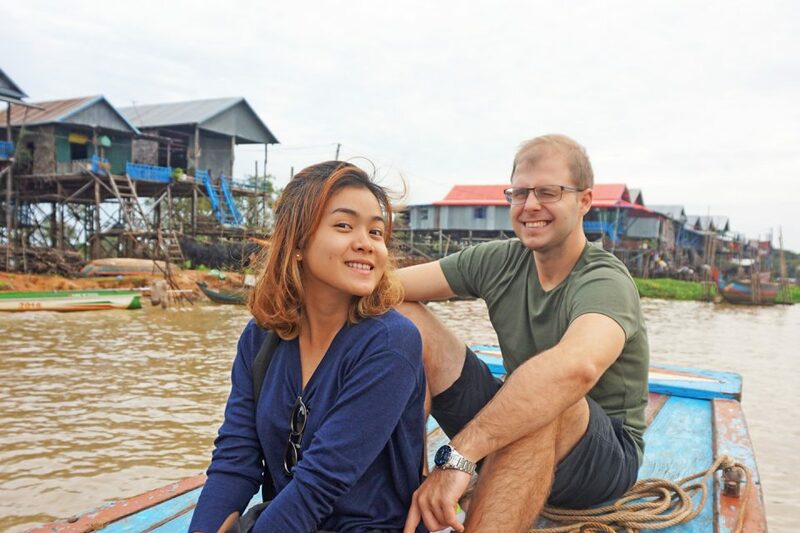 Adventuring off the beaten path is always exciting so we decided to get a taste of local culture and visit one of the floating villages, Kampong Phluk. 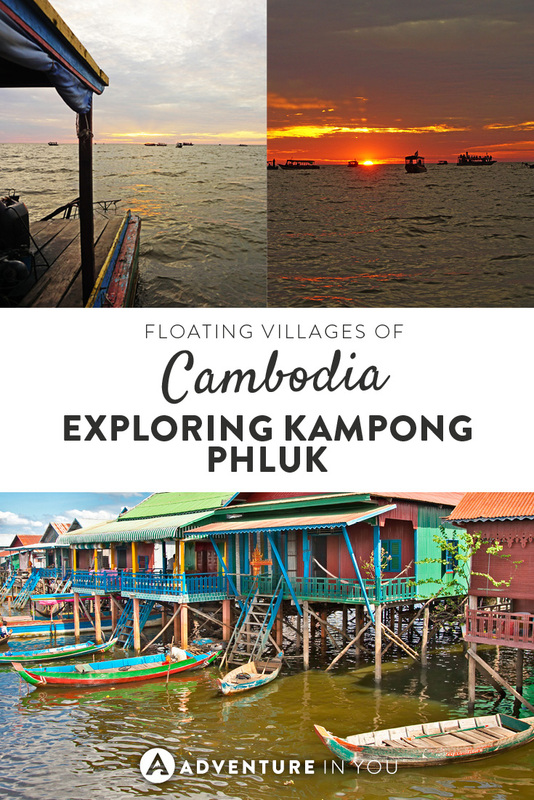 Most sources on the web today call Kampong Phluk village a “floating village,” but that actually depends on what month you go. 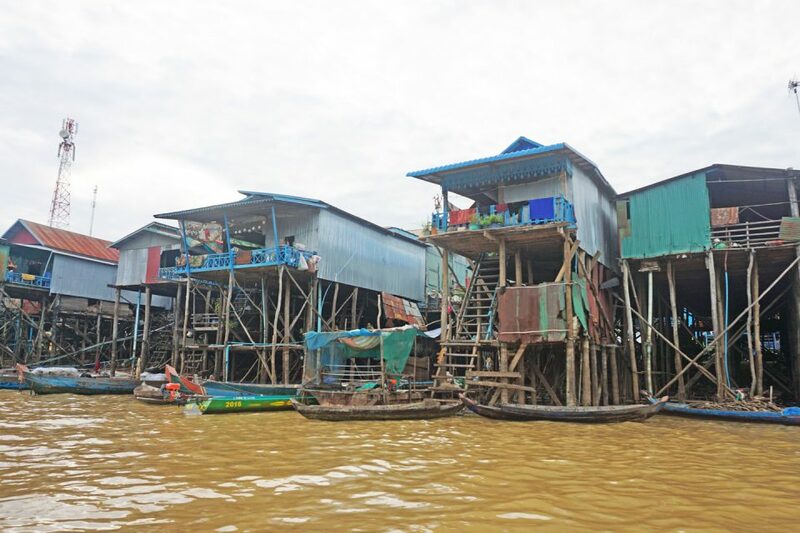 The hand-made houses are suspended by 16-foot stilts like some wild act in a circus. During the rainy season (June to November) the water level rises to just about the height of the structures. 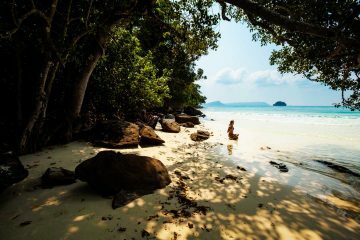 The best time to go, however, is in December or January when the water level drops and you witness temples and schools balancing on thick, wooden trunks. We took a boat up the river that slowed down around crocodile cages, lotus fields, and mangrove forests. 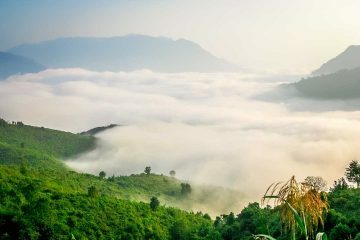 You’ll see the local community preparing buckets of rice directly over a campfire, children paddling their way to school and even a solar powered bar. 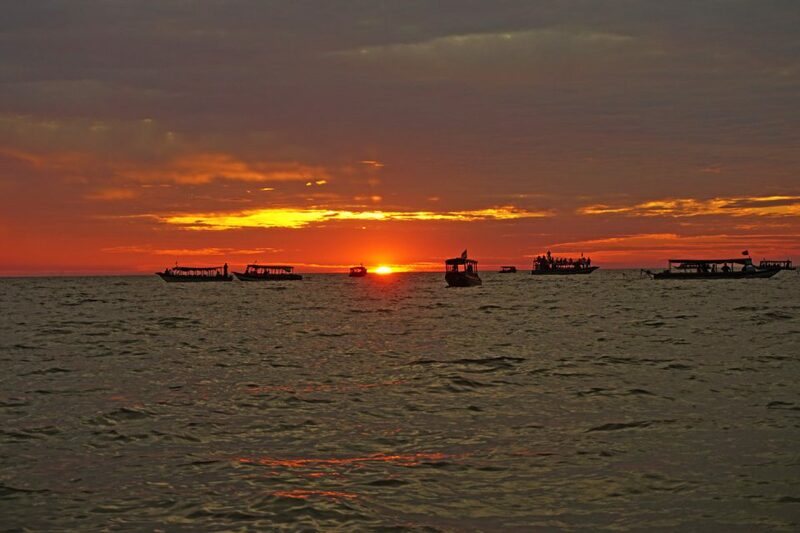 The river that passes the village ends at Tonle Sap lake which provides stunning sunsets to end any day. Once in Siem Reap, there are plenty of tours that take you to the boats for Kampong Phluk village (ask your receptionist). We decided to book directly through our tuk-tuk driver which is a cheaper alternative because we didn’t need the dinner option, just the experience. The ticket booth is literally in the middle of a field but most tuk-tuks know where it is. After passing the ticket booth we continued to the boats. We arrived and a band of people playing billiards out in the open looked surprised for us to be there. One of the locals yelled something out and a boy probably not older than ten came out and signaled for us to follow him. We got onto a long, Mekong boat and were greeted by his older brother. They started the engine which was made from tractor parts and a bicycle chain. Eve and I looked at each other and couldn’t believe that the ten-year-old boy was driving our boat. Note: Don’t worry, most people are not as lucky like us and actually get an experienced boat driver. Safety first! The village tour first passes a stretch of blue buildings which we discovered were a school for the local children. That was followed by big wooden cages which were set out away from the village containing a bask of crocodiles inside captured around the area. It was nice to hear that they do not kill them but release them far away so that they do not harm anyone. You’ll see what life is like over water – the local residents were busy doing laundry, cooking or fishing on top of their wooden boats. Steep, swaying ladders provided the only entrance where we managed to catch people carrying bags and dishes up like pros. Pigs, cats, and chickens lived inside paddle boats floating around. It was really a one-of-a-kind experience. The children have come accustomed to the tourists passing by and wave time to time. 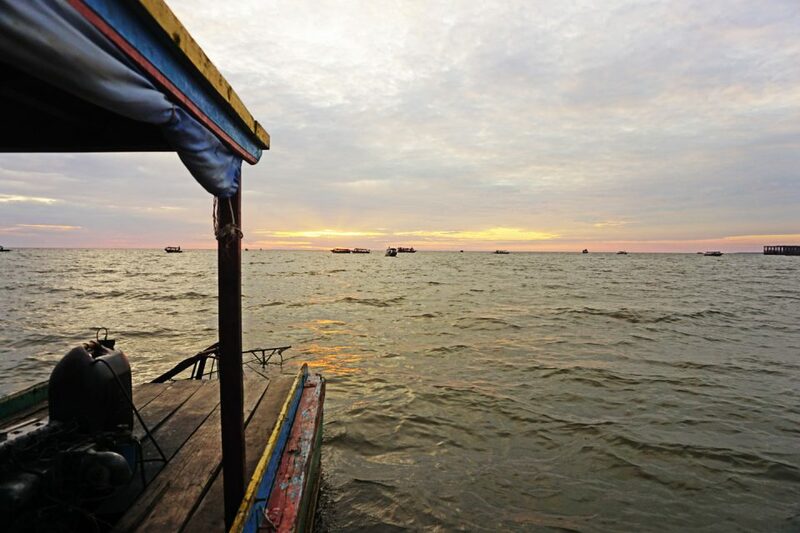 The village river is connected to Tonle Sap lake where much of the fishing takes place. Our boat halted to a stop right in the middle. We made it just in time to catch the sun peaking below the clouds as the sky changed from a bright blue to a luminescent orange. It was truly a remarkable way to end the day. After the sun set and we told our boat drivers we had enough, we headed back the same way we came just before it got pitch dark. Tours will range from $35 to $50 USD pp and will include transportation, tickets and a meal (we also saw one including insurance). 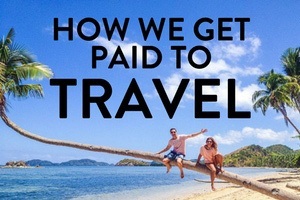 Most tourists do this. 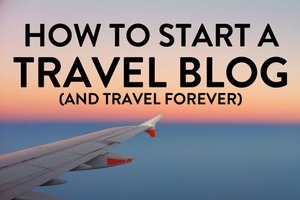 If you want to save a bit of money, organze the transport yourself. The ticket for the boat up to the village is $18 USD per person. The entire trip through the village is about 45 minutes. Getting there takes another 45 minutes so it is a great option for a “half day” experience. 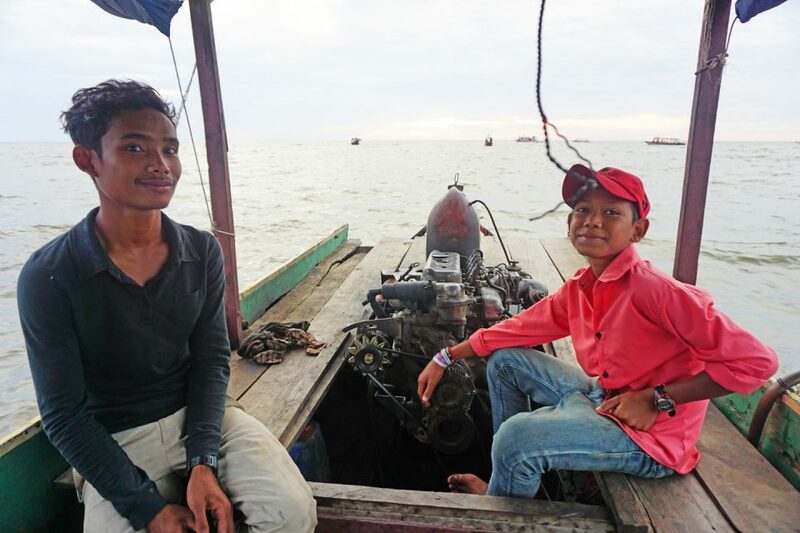 There is an additional option of stopping at a temple or taking a small paddle boat into the mangrove forest for $8 per person which can be an added bonus. Just tell your boat driver(s) that you want to go. 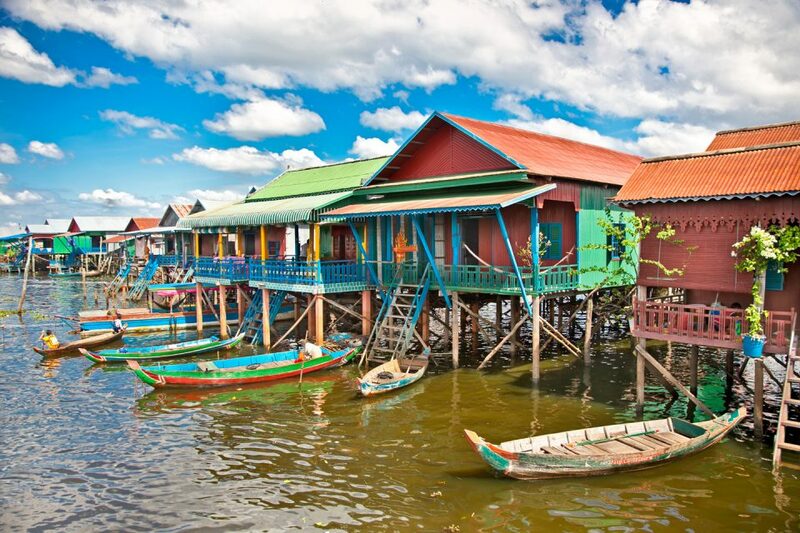 Apart from Kampong Phluk, there are two other floating villages namely Chong Khneas and Kampong Khleang. Chong Khneas is now very very touristy. So touristy that the tour groups that go there are served Korean food (not kidding!). As soon as you enter the village, numerous people are trying to sell, upsell, or guilt you into buying something “for the community”. Our advice, stay away from Chong Khneas. While the other villages are still tourist driven, they aren’t as bad. If you want to venture further, head on over to Kampong Khleang which is around 35km away from Siem Reap. This is also the largest community with 10x more of the local population in the other two villages. While in general, the whole experience for us was worthwhile as it was fascinating to see a new and different way of life. Robert and Eve don’t look like your typical adventurers, but this dauntless duo will catch you by surprise. 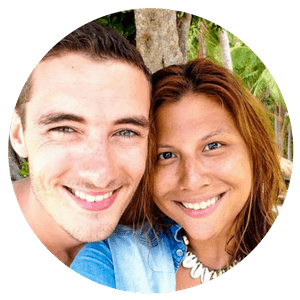 Robert’s background in travel and tourism and expert ability to pack lunches combined with Eve’s mind-blowing perspective on photography makes them the perfect team of conquerors. Hey guys, thanks for the info regarding the floating villages, I would love to do the same. 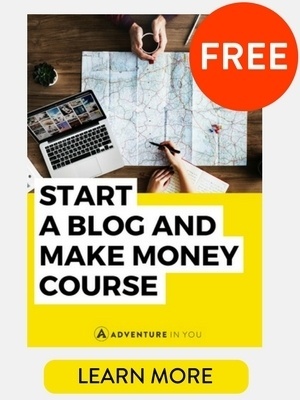 How can I make sure that I dont fall into the trap with the meal option packaged tour? 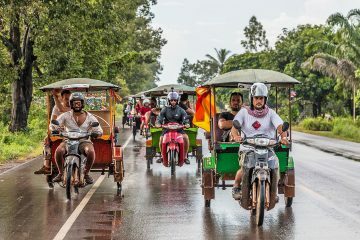 do u have any other contact info or name of the tuk tuk driver or something I could reach to ask for the same type of tour u did? Yes 🙂 Also, make sure you show them the name of the floating villages you want to go to. Also, I would ask a tour agent for the rough price so you know the baseline price to negotiate with the tuk tuk driver. Enjoy!